Welcome to Avilla Immanuel Lutheran Church! The first white settlers in Allen Township, Noble County, Indiana, began arriving in the late 1830s and early 1840s. Among them were German Lutherans who emigrated from northwestern Germany and the present-day French province of Alsace. They had no church or minister, but God had his eye on them and sent a great missionary, the Rev. Friedrich Wyneken, to them. The Rev. Wyneken, a native of Hanover, Germany, answered God’s call to minister to Lutherans in the wilderness of the American frontier. His call was to St. Paul Lutheran Church, Fort Wayne, and Adams County. While ministering there, he went on several missionary ventures in northern Indiana, northwestern Ohio and southern Michigan, where he gathered many German Lutherans and organized congregations. Several of his journeys took him to Allen Township, Noble County, where he found a group of Lutherans near the future town of Avilla. They welcomed him with open arms and were thankful for his interest in them and in the Word of God. According to records of Immanuel congregation, he would come every four weeks and hold services in the home of Samuel Weimer. The first members of Immanuel, which included the Weimer, Diehm and Housholder families, built the first church — a log cabin — on the property owned by Samuel Weimer. 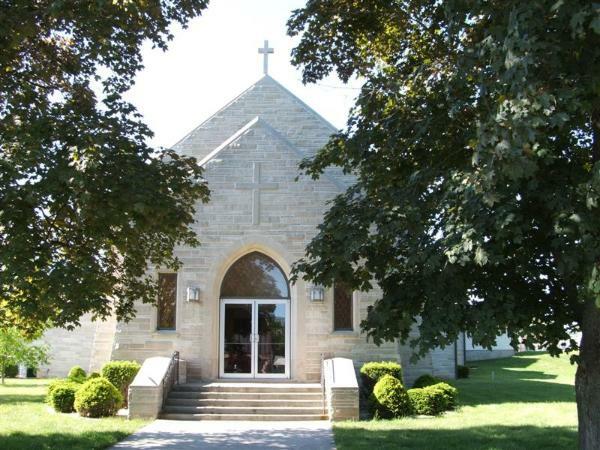 It was located in a woods across the road from the present St. Mary’s Catholic Church on North Main Street, Avilla. It was in this log cabin that Immanuel Lutheran Church was organized in 1844. In 1848, the congregation built a bigger structure north of Avilla, along the Sycamore Creek, just north of the intersection of Old Ind. 3 and the new four-lane Ind. 3. The third church was built in 1855 where the church cemetery is today, 1.25 miles northwest of Avilla. It was a frame building, 38 feet long, 26 feet wide and 16 feet high. It cost $375 for building supplies. The men of the church provided the labor. The building was used until 1893. It later served as the hospital at Sacred Heart Home, Avilla, for many years. In early 1892, due to the growth of the membership, the church building proved inadequate. After much discussion, in 1892, the congregation voted to build a new church in town at the present site on West Albion Street. The new church was 60 feet long, 30 feet wide and 20 feet high with a steeple. The cornerstone was laid on June 25, 1893, and it was dedicated on Oct. 22, 1893. Immanuel conducted a day school from its inception until 1922. From its founding until the early 1900s, all the religious preaching, day school and catechumen classes were in German. Later, English services were held Sunday mornings and German services were held Sunday afternoons. The congregation discontinued its German services altogether in 1935. Immanuel extensively remodeled its church building in 1953-54. Its new educational wing was added in 1974. At that time the congregation donated a portion of its old hall to the town of Avilla for use as branch library. The hall was moved to West Albion Street as part of the town’s centennial celebration in 1976. The hall originally served as the parsonage in the 19th century when it was located northwest of Avilla at the site of the present church cemetery. Sometime between 1893 and 1894, the old parsonage was moved into town and used as the day school until 1922. Until 1975, it was used for the church’s Sunday school and congregational and community gatherings. Immanuel, has been served by 26 ministers in its over 160 years of existence. The longest serving minister was the Rev. Dean Bearman, who served from 1972-2003. The Rev. Patrick Kuhlman is the current pastor.